Northborough chief of police William Lyver Jr, Detective Sergeant Brian Griffin and superintendent Christine Johnson stand outside of the rotunda on the morning of May 31 in response to the note threatening a shooting at the high school. A handwritten message referencing a school shooting initiated a police investigation and resulted in increased presence from Northborough and Southborough police officers both in and around the Algonquin Regional High School building today. According to an email sent to parents and teachers by principal Dr. Sara Pragluski Walsh at 7:08 pm last night, the written message was found in a stall in the bathroom and administration was made aware of the message around 2:00 pm. The administration notified resource officer detective Michael Bissett and an investigation began immediately. An email to parents and teachers from superintendent Christine M Johnson at 10:54 pm confirmed the details sent by Walsh and added that the note did not contain information about targeting specific individuals or a specific school, but it did state that the shooting would take place today, May 31, 2018. Johnson’s email also alerted the community that there would be an increased Northborough and Southborough police presence in the school today. 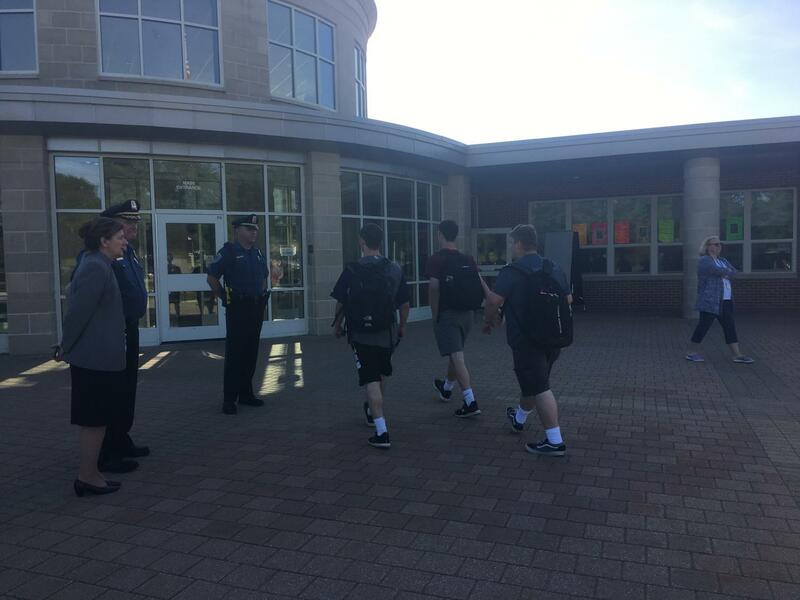 This morning, police stood at each of the school’s major entrances. Northborough chief of police William Lyver Jr, Detective Sergeant Brian Griffin and Johnson stood outside the main entrance at the rotunda. According to Lyver, police will continue to patrol both inside and outside the building for the remainder of the day. All tardies and absences from today will be excused due to the extraneous circumstances that this type of threat creates. This is in line with the school’s standard policies which also apply to other extraneous circumstances, such as difficulty getting to school because of inclimate weather according to Johnson. Johnson also encourages students, staff and community members to report any matters of concern, which is in line with Algonquin’s safe school readiness practices. Teachers were instructed to tell their students about the threat before first period. Teachers also informed students that they should go to guidance if they need to talk or feel scared, and that otherwise, the regular scheduled day should continue as normal.